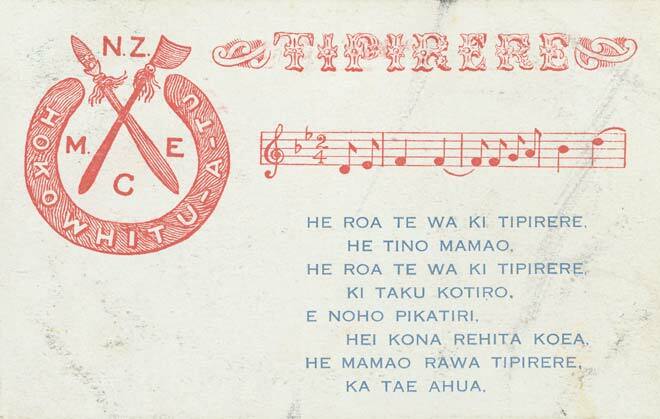 This 1916 postcard bears the words and music for 'Tipirere', the Māori version of the popular marching song, 'It's a long way to Tipperary.' Copies of the postcard were handed out to members of the Māori Contingent Reinforcements who marched through the streets of Wellington on Saturday 18 September 1915, before embarking for the front. The postcards were issued by the National Reserve Headquarters, Wellington, and distributed by Colonel Thomas Porter, commandant of the reserve, a veteran of the New Zealand wars of the 1860s. The Native Contingent was dubbed Te Hokowhitu-a-Tū (the two-times-70 warriors of the war god Tumatauenga) by Te Aitanga-a-Māhaki chief Wī Pere, from the traditional name for a group of warriors.